Novus, nested within the Singapore National Museum, has always been one of those dining places that HFB wanted to pay a visit so imagined his delight when FoodNews, on behalf of Novus, extended an invitation to HFB for a food tasting session – Summer Truffle Creations, crafted by Chef Stephan Zoisl. Having worked with master of molecular gastronomy, Chef Heston Blumenthal, during his brief stint at The Fat Duck while on his food sabbatical, Chef Zoisl part molecular style of cooking is winning attention, and it definitely caught HFB’s interest too! Nothing came close in bribing HFB’s heart when the first starter was served – Beef Carpaccio, made with 200 days grain fed Black Angus beef tenderloin, served with shaved Black Summer Truffle, Poached Egg, Chives and Truffle Scented Mozzarella Spheres. 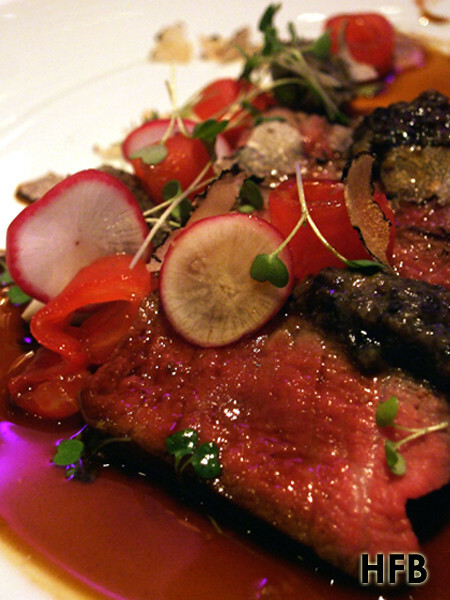 HFB always have a thing for good beef carpaccio, and Novus’ version sat right above many that he had sampled before. 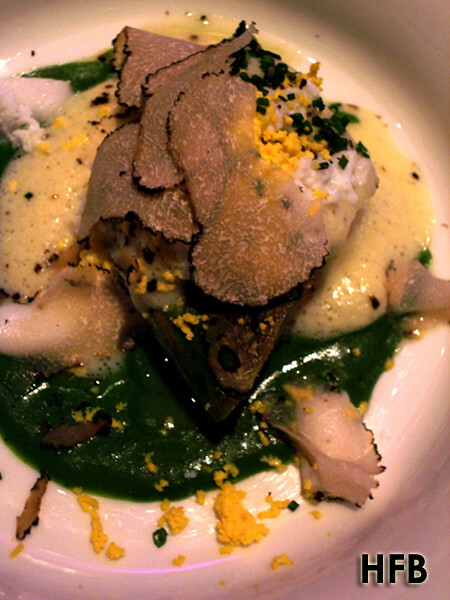 The truffle, along with the mozzarella heightened this dish to a next level. Bravo! June to August marks the season for Tomato, thus it wasn’t a surprise to find Heirloom Tomato & Prawn Tempura as one of the starter. 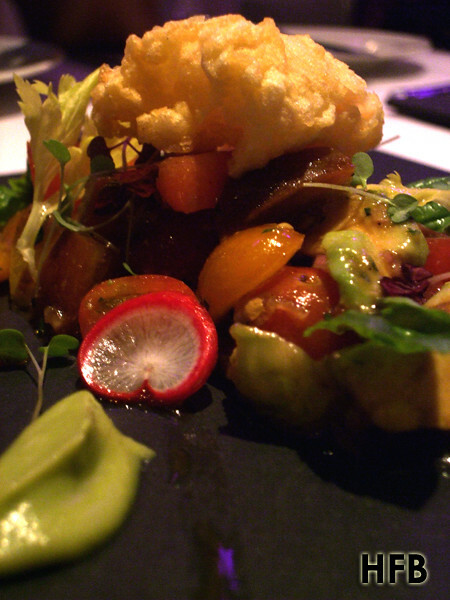 Using an array of heirloom tomato, it was paired with Tempura Prawn, Avocado (puree), and Rocket Cress providing a picturesque dish which displayed an assortment of colours that is pleasing to one’s eyes. With a fancy name of Foie Gras Parfait Treated Like a Salad, the dish of Foie Gras Parfait, Strawberry, Vanilla Grapes and Mesclun Leaves was a dish of harmony. 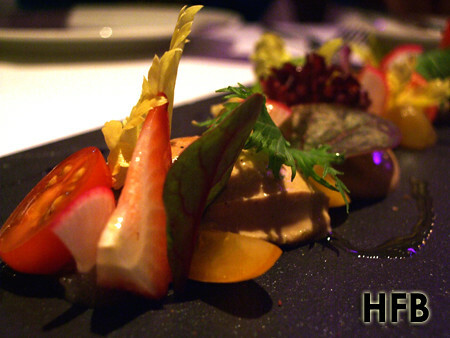 On its own, the foie gras parfait was a little too heavy for HFB, but paired with the grapes it balanced really well. A pity HFB preferred a good slab of liver instead. 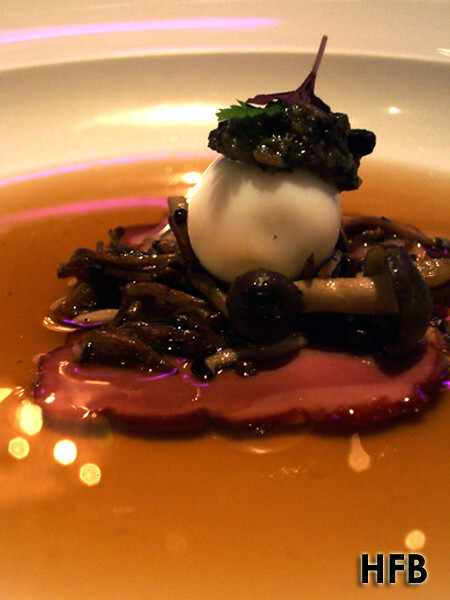 For 2nd course, HFB was served Novus’ signatured Duck Tea – a Duck Consommé topped with Quail Egg, Trumpet and Brown Enoki Mushroom, Smoked Duck Breast and Black Truffle. A soup dish is always soothing for HFB, but he wasn’t overwhelmed by it, perhaps due to heighten expectation of the dish. Nevertheless HFB love the way it was presented, accompaniments served on the plate, before having the consommé poured over it via teapot. Summer Truffle Ravioli, or homemade ravioli pasta stuffed with Ricotta Cheese and served with Summer Truffle, Parsley Sauce, Parmesan Snow and Purple Shiso. Homemade pasta is the way to go and using Ricotta Cheese as a stuffing is truly an ideal pairing. 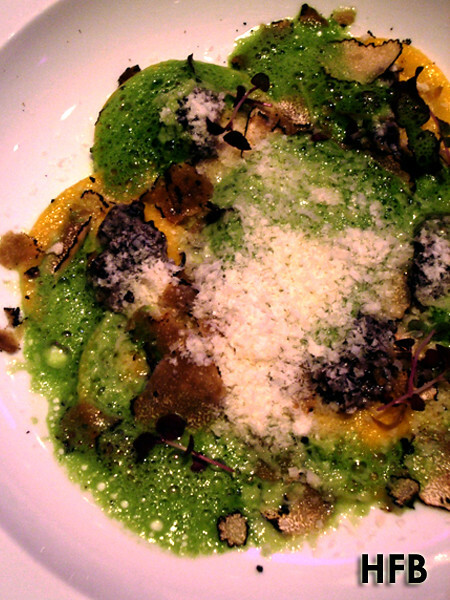 Though HFB didn’t really take to the parsley foam, the truffles and powdered parmesan really did do wonders to the dish. 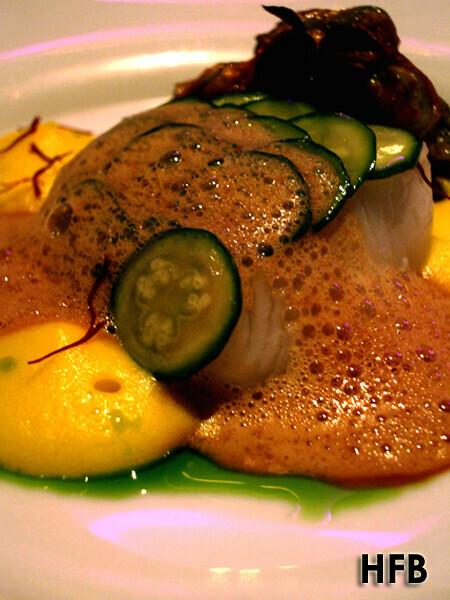 This dish was the highlight of the evening for HFB – the Snow Cod & Zucchini Flower, cooked Sous Vide style, with Shellfish Foam, Potato & Saffron Crème and Stuffed Zucchini Flower. Cooking the fish at low temperature ensured its natural flavour and Omega 3 are locked within. This is the first time HFB had tried cod this way, and most possibly the best he had savoured – the flesh is silky and succulent, almost creating a melt in your mouth sensation. Also not forgetting the immaculate presentation of the dish with the zucchini flower stem arranging neatly, this is truly one dish that captivated both sight and taste. Did HFB also mention that the shellfish foam complemented the fish perfectly? Marvellous! The Ocean Trout & Summer Truffle was slightly lacklustre in comparison with no fault of itself. Stuffed with Kombu Seaweed and topped with Summer Truffle and Chives with Liquid Cottage Cheese Gnocchi and Potato Sabayon, the fish was cooked perfectly all right, but somehow HFB felt the different elements did not gel as well as the cod. What a pity! 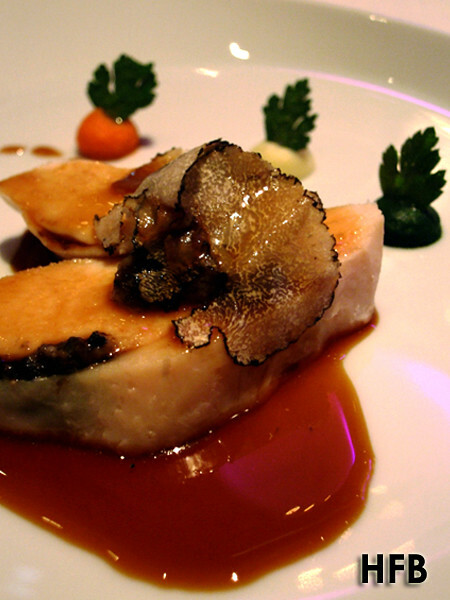 HFB would not usually order a chicken dish in a fine-dining restaurant, but his opinion was seriously challenged that evening with Novus’ very own Organic Chicken & Truffle creation. Chicken Breast stuffed with Truffle Salsa, accompanied with Root Vegetables, Crisp Parsley and Potato Truffle Gratin (unfortunately not featured here), this is as good as a chicken dish can get. 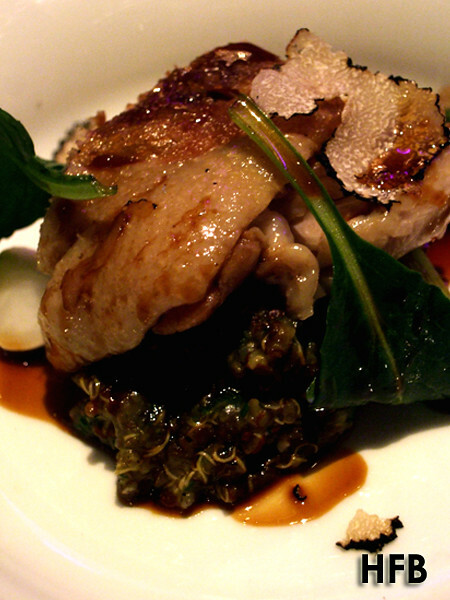 Chicken was flawlessly tender and its clean finishing was roundly balanced with the Truffle Salsa. HFB was beyond doubt impressed. Truth to be told HFB was slightly disappointed with the Crisp Duck Confit, which was cooked with Five Spices, along with Quinoa, Summer Truffle, Baby Spinach and Turnip. Without a doubt the meat was flavourful, but strangely enough, HFB’s portion of duck somehow lacked the crispy skin (as seen from the photo) that aptly made the dish so famous. HFB is not a big fan of quinoa too, but that’s due to his own personal biasness. 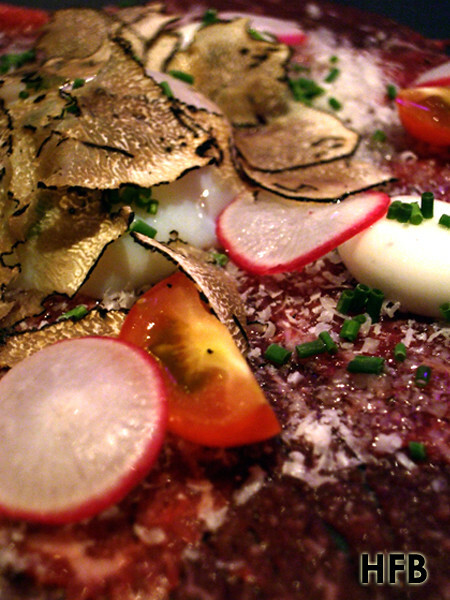 After the beef carpaccio, HFB gladly welcomed the Black Angus Beef Meets Summer Truffle. Sliced Black Angus Beef Tenderloin, served with Wild Mushroom Duxelle, Rocket Cress and a side of Triple Cooked French Fries and topped with Truffle Shavings – HFB thought the ‘meeting’ of truffle shavings wasn’t necessary since the impeccably cooked beef and the wild mushrooms more than hold their own without their more extravagant partner. Definitely a ladies dessert! 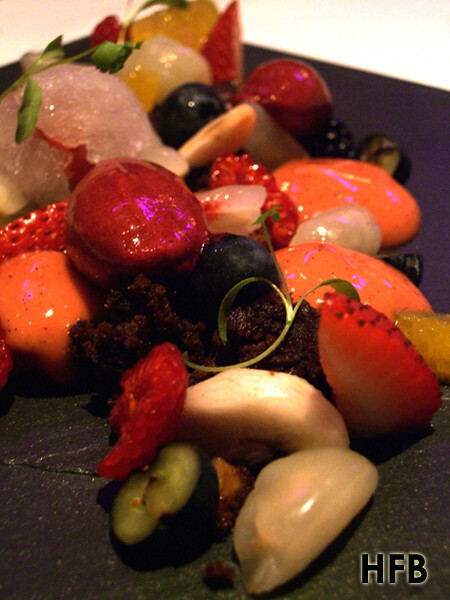 A work of art made up of Mangosteen, Berries and Citrus Fruits Surrounded by Chocolate Crumbles, Elderflower Granite Sphere, Wild Strawberry Espuma & Cassis Ice Cream invoked, the aptly named, Summer Feelings. Snowball & White Peach Sorbet was constructed using Meringue Snow Ball stuffed with Pistachio Ice Cream, White Peach Sorbet and Pomelo. The crust had a hint of honey within and was really crisp and contrasted really well with the ice cream, while the sorbet along with the tart bitterness of the pomelo balanced the overall sweetness. 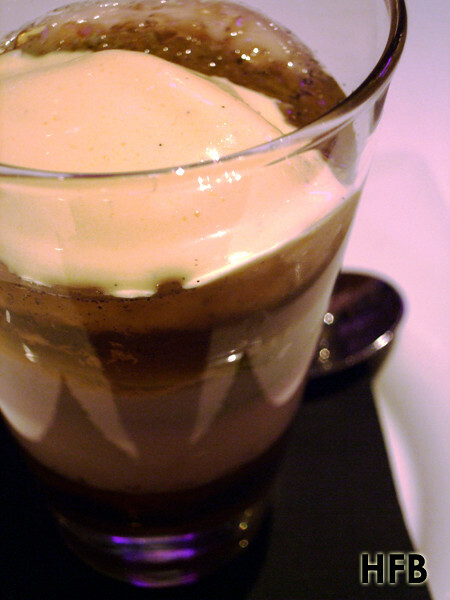 The Verrine of Nectarine Green Tea & Sauternes was made up of Nectarine Espuma, Green Tea Panna Cotta, Sauternes Jelly, Caramel and Vanilla Ice Cream. HFB thought it was a little messy for his liking with all the flavours jumbling up and fighting for attention once he stuck his spoon within. Sorry but this is not his kind of dessert. 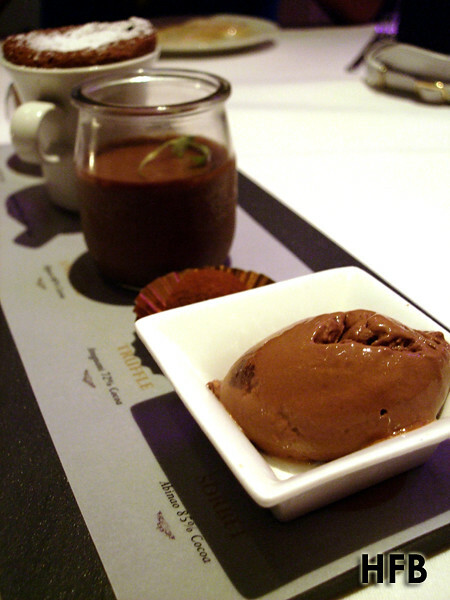 Speaking of which, you can treat HFB to Novus’ Valrhona Chocolate Test anytime – an assortment of chocolate dessert in the different form of Mousse (38%), Soufflé (55%), Crème Anglaise (66%), Truffle (72%) and Sorbet (85%). 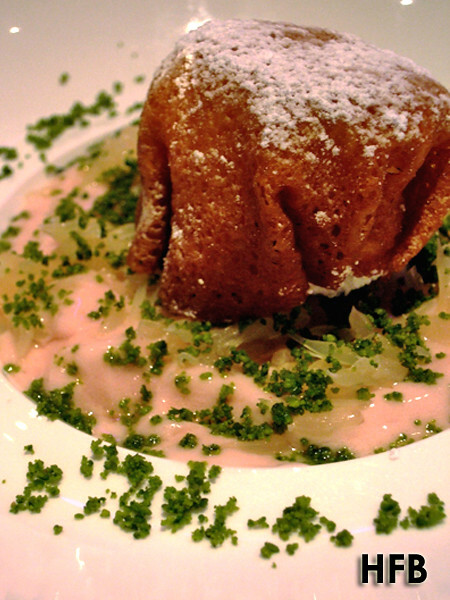 And among all, the soufflé was HFB’s favourite! Death by chocolate anyone? Disclaimer: No ratings would be given, as this is an invited taste test. HFB would also like to take this opportunity to thank Novus, FoodNews, Chef Stephan Zoisl, Ying-Zhi and Shasha for their hospitality.